Online Features: Website  Details about the authors and content of textbook; registration for exam copies. Downloadable figures, problem sets, and more. Evolution is a book on evolutionary biology that integrates molecular biology, genomics, and human genetics with traditional studies of evolutionary processes. Introduction (Part I) gives an account of how the ideas underpinning evolutionary theory developed and a history of experiments and ideas in the development of molecular biology. Origin and Diversification of Life (Part II) describes the history of life on earth from the origin of life to the evolution of humans, with emphasis on the major transitions in genetic organization and novel adaptations that have appeared. The diversity of life is emphasized. The chapters make extensive use of information from complete genome sequences and analysis of molecular mechanisms in development. Evolutionary Processes (Part III) describes how the diversity of life is generated: How variation arises and how selection acts are considered in detail. Many examples used to illustrate these processes are drawn from molecular sources. Human Evolution (Part IV) discusses human evolution and diversity. The benefits of molecular markers for our understanding of human evolution are highlighted and these findings integrated with paleontological evidence. Also discussed is the use of evolutionary methods to identify genetic differences that predispose people to specific diseases and affect their responses to treatment. Additional chapters, found on the Web only, deal with techniques and models used in studying evolutionary biology, emphasizing the contribution of molecular biology and genomics to phylogenetic reconstruction methods. The Evolution Web site (www.evolution-textbook.org) is an invaluable supplement to the textbook, a resource for teachers that will contain downloadable figures (for PowerPoint or overhead display) and chapter problems. Visit the Evolution Web site now for more information about this new book. Request a detailed Table of Contents, Sample Chapters, Exam Copies, and Updates about Evolution. 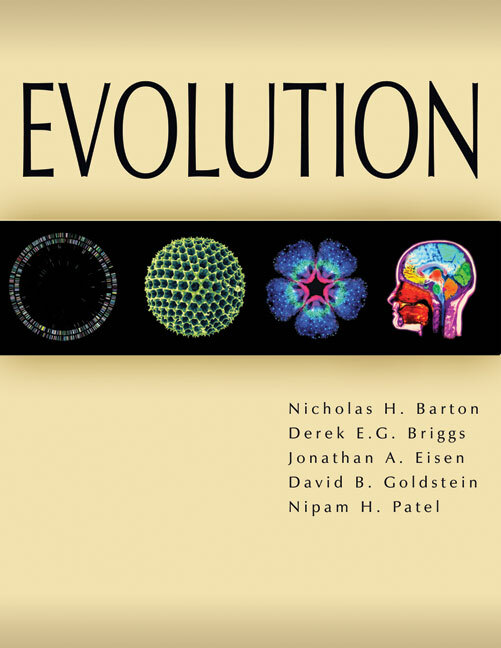 At 833 pages, Evolution by Barton et al. is a large book, and it is copiously and helpfully illustrated with photos, figures and line drawings, mostly in color. The lion's share consists of Part II, The Origin and Diversification of Life, and Part III, Evolutionary Processes. The three chapters of Part I introduce the history of evolutionary biology, including molecular biology, and the evidence for evolution. The final two chapters, in Part IV, provide an excellent, uptodate summary of human evolution. The discussion of the OutofAfrica and multiregional hypotheses of the origin of modern humans is nuanced rather than dogmatic. A section on Genomics and Humanness is brief but incisive. The final chapter on Current Issues in Human Evolution is exemplary and can be profitably read by medical geneticists seeking to establish associations between genes and diseases. Overall, Evolution is well-written, with a nice progression in many chapters from anecdotal points through more didactic renderings of the general principles....The figures are generally quite clear, and illustrate many to most of the major points that need visual aids for understanding. This is an entertaining textbook that is well-timed to take advantage of major trends in the genomics era. Readers who are established biologists will find much to learn from disciplines they do not normally follow, while students will find the approach to evolutionary biology includes many of the modern tools they might not find in other texts on the subject. This book can also be warmly recommended to medical school faculty and clinical investigators seeking an up-to-date look at the most modern chapter in the modern synthesis of evolutionary biology.